This PDF 1.6 document has been generated by Microsoft® Word 2013, and has been sent on pdf-archive.com on 05/12/2016 at 15:54, from IP address 130.223.x.x. The current document download page has been viewed 1917 times. File size: 3.2 MB (46 pages). a well-managed company and possesses a market leading position within the hearing aid industry. valuation of the sector – as not intrinsically justified and therefore exaggerated. demographics and vary across markets, but no significant local rises have been observed thus far. 2-7%) blaming Sonova for turbulence in the US market – a possible vanguard of countermeasures. rather than scope for multiple expansion or unexpected earnings upgrades. network of independent distributors forms the strongest geographic footprint within the industry (Appx. time of writing (Fig. 1). first-time client is 68 years old. adverse mechanisms, which impede confidence in the envisaged path. harms existing relationships with audiologists. implant market puts us at the lower end of analysts’ expectations. of forecasted earnings results in an even bigger surcharge of 33% (Fig. 3). prime example was Sonova’s decision to sell premium products via the US retail chain CostCo. the market segment of reluctant hearing impaired, hitherto difficult to penetrate. realized, Sonova reaches a forward P/E of 21.4x – still high, but intrinsically justified. CHF 122 lies in-between the results of the valuation techniques (Fig. 4). implant issue that arose in 2006 – before the acquisition of the California-based company. innovation capacity is one of management’s biggest concerns and is a problem inherent to the sector. solution for everyone suffering from hearing impairment. The core of the company was founded in 1947 as “AG für Elektroakustik” by French-Belgian investors. Staefa, Switzerland and is listed on the SIX Swiss Exchange since 1994.
are ultimately led by CEO Dr. Lukas Braunschweiler and his executive team (Appx. 8). industry, spreading across all performance levels (from basic to premium) and degrees of impairment. manufacturing business (Fig. 5 &amp; 7, Appx. 5H). minor contributors to the sales total. (Fig. 6). plans in its retail business through further store openings and selected acquisitions. encourages face-to-face consultations – supporting present and future sales. pinch of salt considering the major factors driving the anticipated volume growth. perception of high economic costs associated to wearing hearing aids (“stigmatisation”). by lower prices, upon which we elaborate in the following section. countries to remain below 30%. Yet, emerging markets represent a relatively small percentage of the global market (Fig. 12, appx. 6B). significant penetration gains should therefore be moderated. Medical studies have shown significant benefits for the patient – apart from just hearing on both sides. long-term process and concerns only certain markets. The cochlear implant market is a relatively young branch – the first implantation took place in 1976. 10% over the past 10 years and reached a market value of CHF 1 billion in 2013 (50’000 units sold). the fastest growing segment in the industry. at prohibitive levels. The latter is of special importance to widespread application in emerging markets. and recently tendered large volumes for example. focusing on low-cost products for emerging countries) and market leaders. targets (Starkey and Widex) left. throughout the next 5 years, for the industry as a whole. timeframe, R&amp;D efficiency is essential for the creation of competitive advantages. external devices, which are not based on the 2.4 gigahertz wireless technology (Bluetooth bandwidth). gives inadequate answers to customer needs. aggressive pricing) in order to secure growth. crucial importance to strong partnerships with these gatekeepers. important independent resellers and strategic reactions of competitors. Sonova – ultimately fuelling price wars. innovation and strategic OEM acquisitions – are deprived of their substance. better solutions to industry challenges than its competitors, but possesses a higher valuation. and GN Store Nord (DK), with hearing aids accounting for 86% and 62% of total revenues in 2013.
foundation upon which we build our future estimates (valuation section). forecast of 6.8%, we are below management guidance of 7-9%. reimbursement schemes (especially in Germany and UK) is of an enduring nature. and pulled down EBITA margins down to 10.1% (normalized 21.5%). percentage of sales, both of them remained in a narrow corridor between 2009/10 and 2013/14. positions in periods of “normal” business activity, approaching an EBIT margin of 20.7% in 2013/14. Retail and Cochlear: hitting the sweet spot? do not believe that working capital gives rise to concern. illustration of Sonova’s aggressive strategy of external growth. elaborate on future sales growth and margin expansion in the valuation section. stores), as the OEM’s retail advances represent direct invasions into territory occupied by independents. later half of the forecast period (counteracting standardization gains and scale effects). Sonova. As the depicted performance benchmarks reveal, the group did not outperform its peers. bottom line shows that high expectations remain in force (Fig. 3). interesting point of departure for the hereinafter discussed multiple valuation. finance possible future acquisitions, we do not consider this as an inefficient capital structure. 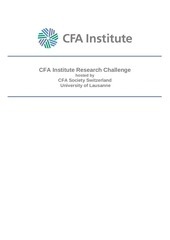 amount of CHF 50-70m p.a. fundamental performance and the market perspective on the sector and Sonova in particular. to the closing price of November 27th. postulated price pressure varies across segments and results in a conservative growth assumption. strongest contributors to 2018/19’s revenue forecast amounting to CHF 2’563m. (Fig. 29, Appx. 1F). dispensers, b) unexpected sales mix shifts possibly unfolding uplifts. expect standard devices to grow at a CAGR in a narrow corridor around our market expectation of 4.2%. Demant. Moreover, strategic moves might be retaliated by the Australian market leader Cochlear. the overall expected CAGR throughout the forecast period. total sales, resulting from a CAGR of 4.3% and 12.2% for HI and CI business respectively (Fig. 29). the forecast period (Fig. 30). financial year 2017/18 – one year later than predicted (Fig. 24). 13.5%, in line with Sonova’s expectations (reaffirmed in H1 analyst call). throughout the last 3 years (Appx. 3B). growth exercise a tremendous impact on our valuation. equity value and the diluted number of shares results in a share price of CHF 119.
rates and Sonova’s strategic agenda offer little scope for share prices beyond the current level (Fig. as a result of a more prominent role of the cochlear business and Lyric within the sales mix. This file has been shared by a user of PDF Archive. Document ID: 00517444.